15 minutes of raw, new Rage 2 gameplay has emerged, courtesy of a recent on-stage demo. The result is the most honest look at the upcoming and zany first-person shooter, but perhaps not its best showing. 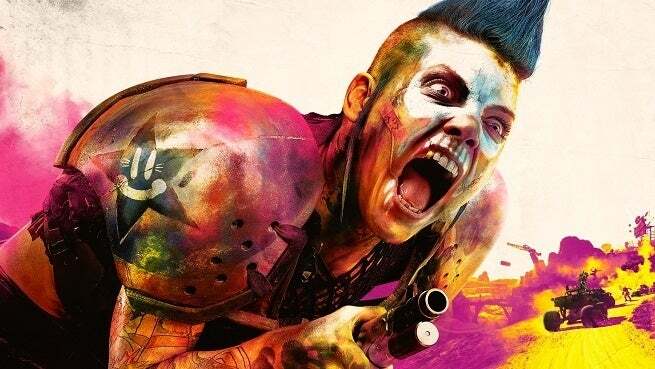 Rage 2 is easily one of my most anticipated 2019 games, even if I think it's a little too colorful and tries a little too hard to be madcap at times. But the promise of it being jointly developed by first-person shooter experts id Software (makers of DOOM) and open-world experts Avalanche Studios (Just Cause, Mad Max) is too promising not to be excited about. That said, this new footage has me a little less excited than before seeing it. Now, it's worth pointing out that the person playing the demo: isn't very good. Further, it's meant to show certain abilities and gameplay features, not showcase the fluidity of the game's gameplay in general. But beyond the abilities of the demo-er getting in the way at times, there also seems to be something wrong with the game's textures in the footage. Whether this is a video issue or just an issue with the game, isn't clear. Maybe it's neither. Maybe the textures just look like that? I hope not. Rage 2 is in development for PlayStation 4, Xbox One, and PC, and is poised to release worldwide on May 14, priced at $59.99 USD. At the moment of publishing this, there's been no word of a Nintendo Switch port. However, previous Bethesda games have come to the Nintendo console in the post-launch period, so it's possible the same will be the case with Rage 2. "An asteroid has annihilated 80% of the earth’s population, and humanity’s numbers are dwindling. Ruthless and bloodthirsty gangs roam the open roads and the tyrannical Authority seek to rule with an iron fist. As Walker, the last Ranger of the wasteland and a threat to their power, you have been robbed of your home and left for dead. Now you’ll have to rage for justice and freedom. With ludicrous vehicle combat, super-powered first-person mayhem, and an open world full of emergent madness, you will tear across an unforgiving wasteland battling sadistic gangs to find the tools and tech needed to crush the oppressive rule of The Authority once and for all."